(left to right) Steve Mickelson, chair of agricultural and biosystems engineering and Charles R. and Jane F. Olsen Professor, and Dirk Maier, professor of agricultural and biosystems engineering, have been elected Fellows of the American Society of Agricultural and Biological Engineers. 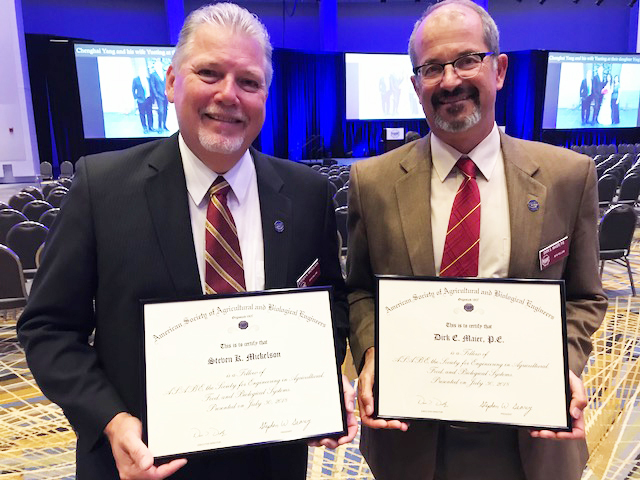 Mickelson and Maier were inducted in a ceremony held at the ASABE annual international conference in Detroit. Of the just 13 ASABE members elected Fellows this year, two were Iowa State faculty.